In the month of January, Disney exercised their right of first refusal (ROFR) on 50 Disney Vacation Club (DVC) contracts, and DVC Resale Market sold 561, resulting in an 8.9% buy back rate. (Contracts Bought Back in January / Contracts Sold in January). The waiver rate for January was 91.1%. With 50 buy backs, January became the 2nd highest month we have observed for volume of buy backs. The highest volume of buy backs seen in one month was the previous month, December of 2018, which saw 55 buy backs. Not only was the volume high in December, but the percentage of buy backs was record breaking at 27%. This led to speculation in December of a potential direct price increase, which did occur on January 16th. The reason the buy back rate is much lower in January despite the high volume of buy backs is due to the large amount of sales in January, driven by not only peak buying season (typically January – April), but also the urgency created from DVC resale restrictions that went into effect on January 19th. The average price per point for DVC resales reached a record high in January at $118/point. If the higher selling price per point maintains, it will be interesting to see if that impacts the buy back rate going forward. 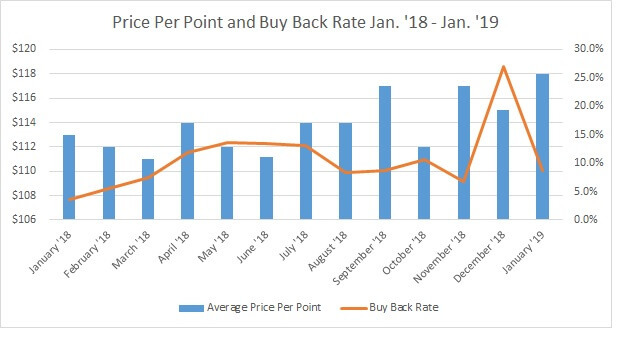 The chart below shows the relationship between the average selling price per point and the buy back rate from January 2018 through January 2019. For those new to the concept of Right of First Refusal, it is the option Disney Vacation Club has to purchase any resale contract after a sales price has been agreed upon, and the contract has been executed. Each contract must be forwarded to DVC for review. DVC typically takes no more than 30 days to review the contract. At their discretion, Disney may step in and purchase the property themselves at the terms agreed upon by the Seller and original Buyer. DVC then becomes the Buyer, and the purchase is complete. Once DVC is the buyer there is not an opportunity to come back with a better offer in hopes of still purchasing the contract. In January, eight different DVC resorts experienced buy backs. Bay Lake Tower, which went completely under the buy back radar in 2018 until December, starts off 2019 with a whopping 13 buy backs. Bay Lake Tower also had the highest percentage of buy backs for any one resort in January at 20%. In January, DVC Resale Market experienced buy backs for Animal Kingdom, Bay Lake Tower, Beach Club, Boardwalk, Grand Floridian, Hilton Head, Old Key West and Saratoga Springs. Hi Nick! Love reading your ROFR report. Thanks for taking the time as it’s very interesting. Do you have an explanation as to why disney’s suddenly going so crazy over BLT after completely ignoring it for most of 2018? I’m thinking i should have bought more BLT than i did, but of course that’s probably a common thought after buying points (should have bought more). Effective for resale purchases submitted on or after January 19, 2019: Disney Vacation Club resale contracts purchased for the original 14 DVC resorts will only be able to exchange into those 14 existing resorts in the DVC network. These contracts will not be able to exchange into Disney’s Riviera Resort, Reflections – A Disney Lakeside Lodge and possibly additional future properties in the DVC system. All Members will still be able to exchange with RCI. Once sales of Disney’s Riviera Resort begin, Members who purchase a resale of Riviera will only be able to stay at Disney’s Riviera Resort in the DVC network. Those Members will still have access to RCI. In theory, if a transaction was submitted to Disney today and the proposed closing was scheduled for 75 days in the future, Disney could take the full 75 days to decide whether it wants to ROFR the deed. Eric – they generally try and keep it at 30 days or under and for the most part the vast majority are, but they have stated they do not have to keep it at 30 days or under. In terms of taking recourse, given they have made it clear their position, you would have to seek legal advice on challenging their position. Does this mean certain resorts not mentioned had no buy backs? Geoff – correct, if the resort is not mentioned in the blog, it did not have a buy back in January. Ian – we don’t publish full details on every contract that gets waived, mainly due to the enormity of the data (i.e., 561 contracts sold in January), however, we try to provide a summary of selling price for all resorts to provide directional information. Please see our latest report for more details: https://www.dvcresalemarket.com/blog/dvc-resale-average-resale-prices-for-2018-january-december/. I should have January’s report on average selling prices done later this week. Combining this average selling price report with the ROFR report should provide some strong direction for those wanting to avoid ROFR, but of course when you call us we can provide any more specific details on contracts that were waived that were perhaps strong comparables to what you are buying. My beach club contract that got bought back by Disney for an Oct use year and 220 points isn’t listed. Ellen – I just double checked, I don’t see any contract matching that description with your name as the buyer from the January data. Do you have a contract number or a listing ID from us? Do these include ones that are still in the Right if refusal process? (Decision not yet made)? Chris – thank you for your question, and hopefully I haven’t created too much confusion. If you are referring to the buy back rate, it is a monthly calculation (Contracts Bought Back in January / Contracts Sold in January) so yes, it would include sales numbers from some contracts we have not heard back on and we would have some buy backs that were submitted in the previous month. The main reason we provide the rate using a monthly methodology vs. per contract methodology is using a per contract methodology would delay the data potentially up to 5-6 weeks as that is how long Disney is taking with some buy back decisions now. Waiting that long would obviously begin to make the data less relevant and hurt the intent of providing the data in a timely manner for making purchasing decisions, which is the main purpose of the blog. The main substance of the report is really the actual contracts bought back. The buy back rate is to give people a general idea of Disney’s current aggression level if you will. And historically, the market has be so consistent with sales and Disney has be so quick (historically within 2-3 weeks) in making buy back decisions even doing it on a monthly basis would have little variance to doing it on a per contract method. However, this month could easily be an exception with so many sales and Disney so far behind with making ROFR decisions that the monthly methodology may not be giving the best idea of Disney’s aggression level, hence why I alluded to a low rate due to a high number of sales. Hopefully, this helps clear up any confusion. Nick, Thanks for the very informative monthly rofr updates and also for this clarification. Does this mean that the assumingly large number of contracts sent to rofr just prior to Jan 19th resale restrictions are actually mostly not in this data yet. And consequently we will see how Disney reacted to these in February report? Alex, yes, a large number of those sent prior to the 19th are still in the ROFR process. The latest date Disney has reviewed to date is submissions to them on January 9th. Thanks for the info… however ..some confusion… you listed those as sold in Jan 2019… yet my sale is not there and I haven’t heard from anyone yet… are all the listing only from Jan? Matt – the only contracts listed in detail are those that got bought back, not all contracts sold.